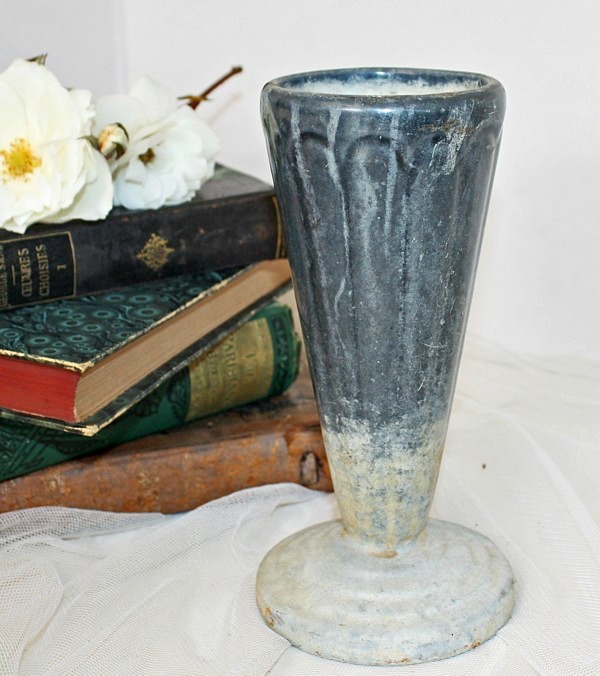 Fantastic Art Deco Vintage Vase from France, enamel over heavy Cast Iron, in French Blue. Decorative 1920's design with a great classical and elegant shape, this is a heavy stunning piece. Exquisite finish and patina, signs of wear, just exactly what you want if you are looking for the real thing. Often used graveside in a French cemetery for a loved one's weekly floral tribute, a sculptural piece of art. Display on your mantel, on your desk for your collection of vintage fountain pens, top with a moss ball as a decorative accent in your home. Measures 3~1/4" x 7~1/2" high.